Whether for a dietary restriction due to a specific health issue or just for keeping sugar intake in check to maintain good health in general, some people follow a diet that emphasizes foods with a low glycemic index or load. This diet is often used as part of the nutritional management of diabetes. We offer a collection of fruit baskets that are a great gift option for people with diabetes or people who are restricting dietary sugar. 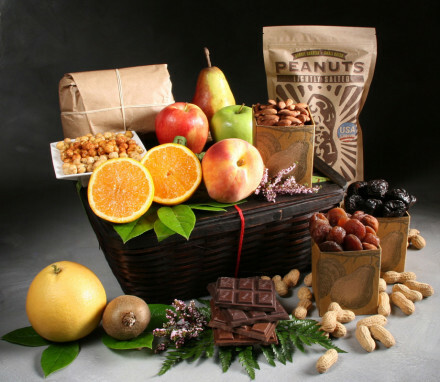 Our food gift baskets for diabetics are not only healthy but are also quite tasty too! Essentially, some foods can cause large and abrupt increases in blood sugar that cause the body to respond quickly to recover stable blood sugar levels. Over time, this can tax the body’s resources to maintain balance. Foods low on the glycemic index raise blood sugar more slowly and not as high as other foods keeping blood sugar levels naturally more even throughout the day. The glycemic index (GI) was developed to make it easier to choose foods with low glycemic loads. Scores of 55 or under indicate a low glycemic food. Most fresh fruits are naturally low on the glycemic index, making them good nutritional choices for many people following a low glycemic diet, including people with diabetes. 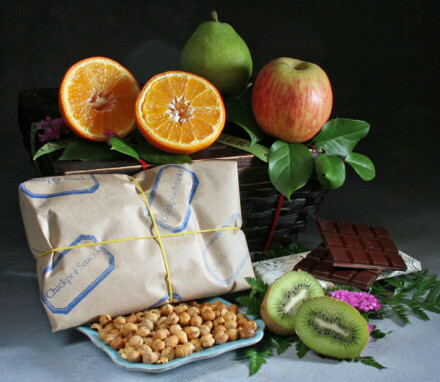 Our Even Keel Low Glycemic Gifts are a great food gift for diabetics. For this collection, we have selected those fresh and dried fruits with the lowest glycemic load. In addition, we include several other diabetic-friendly treats in our Even Keel Gifts such as stevia-sweetened (no sugar) 70% dark chocolate and milk chocolate bars by Coco Polo, low glycemic (GI 14) roasted chickpea snacks in Original, Sea Salt & Garlic and Spicy Lemon Zest flavors, USA grown barrel-roasted peanuts in the shell (GI 14), and dry roasted unsalted almonds (GI=10). Shop our collection of low glycemic gift baskets today and surprise your friend, family member, coworker, or client with our healthy treats! *Although fruit is a healthy food that can be used for special dietary purposes, our food gifts at Manhattan Fruitier are not constructed to prevent, cure, or treat any condition or disease. Since we are not medical professionals, we are not equipped to give medical advice. Please reach out to a medical specialist to ask about which foods you should be eating.